This island ranks #2 of the "Best islands in Cairns"
Fitzroy Island Resort is the only hotel on the island. Room rates start from US$120 per night. The hotel is very good, but nothing more. It's Ok as the price is relatively cheap. There is also a camping site in the hotel. Fly to Cairns international airport (CNS). Next walk or take a bus to the stop "Cairns City platform 2" (routes 110, 110N, 111, 113, 120, 120N, 121, 123, 130, 131, 131N, 133). Next walk 600 meters to the pier of Cairns Reef Fleet Terminal. Next take a 45-minutes journey by Raging Thunder Adventures ferry, - departs at 9am and returns back at 4:30pm. 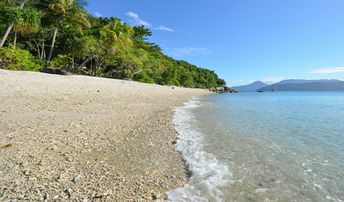 The best time for a beach holiday in the Fitzroy island near Cairns is a dry season from May to November.